Any Player/Any Era: Bobby Grich for Baseball Past and Present: http://baseballpastandpresent.com/2012/03/22/playerany-era-bobby-grich/. A look at the great career of Grich and how he might have fared on the 1990s Atlanta Braves. Any Player/Any Era: Tony Phillips for Baseball Past and Present: http://baseballpastandpresent.com/2012/02/09/playerany-era-tony-phillips/. A look at how Tony Phillips would have fared with the 1950 Cleveland Indians. I’m pretty sure I picked this card out of the thousands I go through because I thought Ruppert was misspelled (it isn’t) and the name makes me chuckle. It probably makes me chuckle because of Family Guy, but, in my head, Ruppert is really Higgins from Magnum PI – the mind does funny things. I figure I also liked the rather mundane factoid as well. He enjoys both karate and racquetball (presumably not at the same time). I don’t really like either. Karate wasn’t my thing and I’m not a fan of Martial Arts movies (unless it is Mortal Kombat or stars JCVD). Racquetball I enjoyed a little, but it reminds me of old fogies with short shorts and smelly socks. I also hate squash (the game, not the food, acorn squash soup is delicious). Anyway, the reflexes and agility required by both enjoyed activities must have helped Jones during his career. In 1977, he made 465 putouts, the 27th most in a season ever. 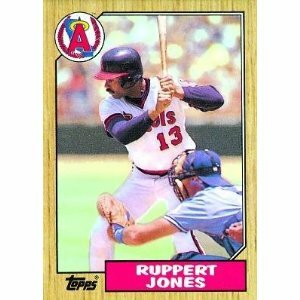 In a game on May 16, 1978, Jones recorded 12 putouts, thereby tying the major league record for putouts by an outfielder in an extra-inning game. He batted fourth in the contest, went 1/6 with two Ks and his average stood at .213. Former flip-sider Shane Rawley took the loss. 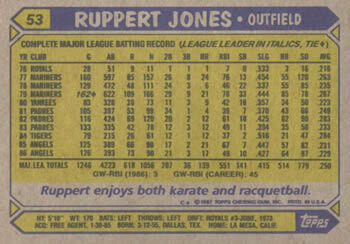 The following year, 1979, Jones recorded 453 putouts, the 44th most ever in a season. The man could track down balls (even though his defensive abilities seem suspect – 2.2 dWAR for his career). Even before all that, Jones was the first pick in the 1976 expansion draft by the Seattle Mariners, after being selected in the third round of the amateur draft by the Royals in 1973. His 1977 season made the Mariners look like geniuses. He went .263/.324/.454 with 24 bombs – he was worth 3.3 wins above a replacement player. However things wouldn’t progress. Aside from his record setting put-out game in ‘78, his season was a disaster. But he bounced back and played well for the Mariners in ’79, finishing his career there worth 6 WAR. He’d spend one year with the Yankees and then three with the San Diego Padres. He played his best ball for the Padres (7.5 WAR), but they granted him free agency after the 1983 season. He signed with the Detroit Tigers. He appeared in just two games for the Tigers in the postseason that year, didn’t contribute much, but was part of a win in the World Series against the Padres. 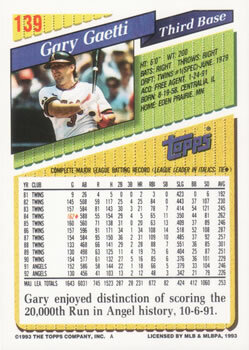 The majority of his post-season experience came the year before this card was printed. 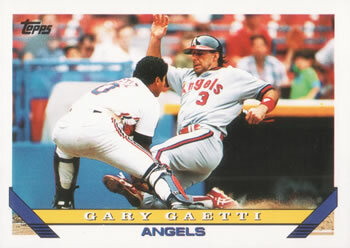 He went 3/17, but walked 5 times for the Angels against the Boston Red Sox. And that would wrap his last real season in the majors. He came back in 1987 but couldn’t buy a base hit. He played another year in Japan before hanging it up and focusing on Karacquete, a new sport that never quite caught on.